Hundreds of thousands of Jewish camp alumni – and their parents – have long known that those halcyon weeks spent at Jewish summer camp don’t just cement lifelong friendships, they strengthen Jewish identity. Now they have it in writing. A new study on the long-term impact of Jewish overnight camp concludes that those who have attended camp are more Jewishly engaged as adults, according to 13 key variables, than those who did not go to camp. “We finally have a tool that proves Jewish camp works, that it helps create a more vibrant Jewish future,” said Jeremy Fingerman, CEO of the Foundation for Jewish Camp, which advocates for more than 155 Jewish nonprofit camps in North America and sponsored the study. “Camp Works: The long-term impact of Jewish overnight camp” used data from 26 national studies of adult Jewish engagement, including the 2000-2001 National Jewish Population Survey, to produce the first statistical look at the effect of Jewish camping on individual as well as communal Jewish identity. The report shows the most pronounced increase in Jewish engagement in four areas not typically associated with non-Orthodox Jewish behavior. Three of them have to do with Jewish communal identity: Camp alumni are 55 percent more likely than Jewish adults who did not attend camp to say they are “very emotionally attached to Israel”; they are 45 percent more likely to attend synagogue at least once a month; and 30 percent more of them donate to Jewish federations. This is significant, says lead researcher Steven M. Cohen, director of the Berman Jewish Policy Archive at NYU Wagner, because those three behaviors indicate a certain level of Jewish communal commitment, and it is precisely that communal identification that many Jewish experts fear is most at risk. “Where camp has had its strongest effect has to do with its creation of an intense, temporary Jewish community,” said Cohen. That communal experience imprints on the individual, he surmised, leading to a greater propensity to view one’s self within a larger Jewish social network in adulthood. The other 10 areas of investigation also revealed increased Jewish engagement among camp alumni, from a 37 percent increase in those who “always/usually” light Shabbat candles to a 5 percent increase in the number of those who “always/usually” light Chanukah candles. These 10 areas are related to an individual sense of Jewish identity. Camp’s impact is more pronounced among non-Orthodox Jews under 49 than their elders, the report notes. 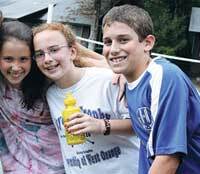 More than 70,000 children and teens attended Jewish overnight camp in 2010.